Online ordering menu for Fresh Hub Cafe Grill and Juice Bar. 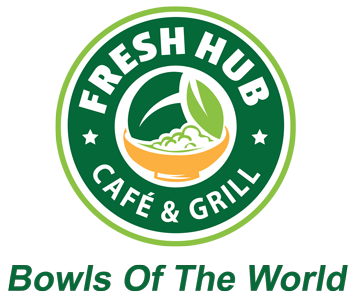 "Bowls Of the World" Breakfast, Lunch & Dinner ------------------------------------------------------------ Welcome to Fresh Hub Cafe & Grill, serving the tastiest Salads and Brunch entrees in Jersey City! Try our clean, Signature fresh salads like our Veggie Sensation Salad, Avocado Salad, or our Caesar salad. You can also build your own salad! Also try our favorite Breakfast omelets like our Bacon Cheddar Omelet, American Cheese Omelet, or our Garden Omelet! We also offer an assortment of fresh-crafted burgers and sandwiches like our Texans Burger, Turkey Burger, or our Barbecue Pulled Pork Craft Sandwich! Order carryout online and find us in Downtown Jersey City along Christopher Columbus, Southwest of Grove Pointe!